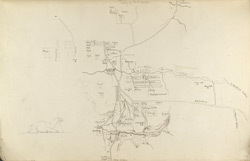 Pen-and-ink plan of Sholapur (Maharashtra) by George Boyd (1800-1850), dated between 1821 and 1844. This is one of 95 drawings (90 folios), chiefly of landscapes and monuments in the Deccan, West India and Afghanistan made during that period. Boyd served in the Bombay Infantry from 1820 to 1850 and was mainly employed in survey work. From 1822 to 1831 he was in the Deccan and Satara; in 1835 he was on survey in Kathiawar; and in 1839 he was making road surveys in Sind. He was mentioned in dispatches during the war in Afghanistan in 1840 and in 1842 he worked on a survey between Quetta and Kalat. Sholapur, meaning ’16 villages’, is situated in the centre of the large Sina plain in Maharashtra. To the south-west of the city is a fort which is surrounded by a double line of fortifications with towers and crenellated parapets. The outer wall was constructed in the 14th century while the inner wall and four great square towers date from the 16th and 17th centuries. The town was formerly enclosed by a wall, 4 kilometres (2 and a half miles) in circuit, but this was mostly pulled down in 1872 to make room for the growing town. Where they are still standing the battered walls are 8 to 10 feet high, 4 to 6 feet wide, and 3 to 4 feet wide at the top. To the south of the city is Siddhaswar Lake which boasts a temple at the centre.